Dr Bernice M. Murphy B.A. (QUB), M.A. (QUB), Ph.D. (Dublin), F.T.C.D. Assistant Professor; Lecturer in Popular Literature, Head of Sophister Year; School of English Adviser for the TCD/Columbia Dual BA Program. My major teaching and research interests lie in popular literature and American horror and gothic fiction and film. I undertook my undergraduate and MA studies at Queen’s University, Belfast, and did my PhD on the work of Shirley Jackson here at TCD. I held an IRCHSS Post-Doctoral research fellowship at Trinity from 2006-8 and was appointed a lecturer in the School of English in 2008. I was director and co-director of the M.Phil in Popular Literature from 2009-18. I am currently the head of Sophister Year, and the School of English advisor for the TCD/Columbia Dual Degree Program. I was made a Fellow of the College in April 2017. I specialise in the study of place and space in American horror and gothic narratives, and have published extensively in this area. To date, I have published three monographs on American horror and gothic narratives: The Suburban Gothic in American Popular Culture (2009); The Rural Gothic in American Popular Culture: Backwoods Horror and Terror and the Wilderness (2013) and The Highway Horror Film (2014). I have also edited the collections Shirley Jackson: Essays on the Literary Legacy (McFarland, 2005), and, with Darryl Jones and Elizabeth McCarthy, It Came from the 1950s! Popular Culture, Popular Anxieties (2011). My textbook Key Concepts in Contemporary Popular Fiction was published in 2017 and my essay collection Lost Souls: Essays on Horror and the Gothic’s Neglected and Forgotten Personages (co-edited with Elizabeth McCarthy) appeared in 2016. My most recent book is Twenty-First Century Popular Fiction (2018), which I co-edited with my colleague Stephen Matterson. I have contributed articles to publications such as the Horror Homeroom website, The Stinging Fly, and The Irish Times. Along with Dr Elizabeth McCarthy, I founded The Irish Journal of Horror and Gothic Studies in 2006, and co-edited the journal until 2012. I am currently writing a book about representations of California in American horror and gothic narratives, and have received research funding from the Arts and Social Sciences Benefaction Fund to support this endeavour. I have a strong professional and personal interest in horror, and regularly review films and television shows for The Green Book and The Irish Journal of Gothic and Horror Studies. My undergraduate modules in 2018/19 include American Identities and Contemporary Popular Literature and the Sophister options American Horror Stories: Narrative, History, and Nation and An Invisible Literature: Exploring Science Fiction, I will also be contributing lectures to American Genre, Theories of Literature, Cities in Literature, and Children’s Literature. I have presented my research at a wide range of national and international conferences, including the International Gothic Association (IGA) biannual conferences in 2007, 2009, 2011 and 2013, the 2012 Popular Culture Association/American Culture Association annual conference in Boston, and the 2015 and 2016 IAAS conferences. I have given keynote addresses at four conferences to date, most recently the July 2018 IGA conference held at Manchester Metropolitan University and the ‘Madness in Popular Culture’ conference held at Edinburgh University in May 2018. 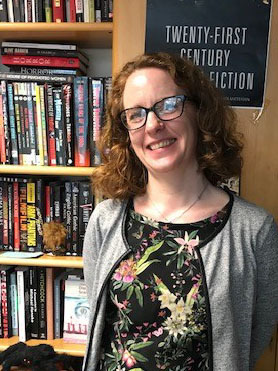 My current PhD student is researching post-1950s American eco-horror narratives, and I have previously supervised PhD theses on the horror genre and child-related controversy and on representations of forests in the gothic. In addition, I have supervised numerous M.Phil and undergraduate dissertations. I am happy to respond to supervision inquiries from prospective research students interested in contemporary horror and gothic studies and related topics within American literature. Queries from students interested in working on Shirley Jackson are also very welcome. The Highway Horror Film. Basingstoke: Palgrave Macmillan, 2014. The Rural Gothic in American Popular Culture. Basingstoke: Palgrave Macmillan, 2013. The Suburban Gothic in American Popular Culture, London: Palgrave Macmillan, 2009. (Edited, with Stephen Matterson), Twenty-First Century Popular Fiction. Edinburgh University Press [Forthcoming, January 2018]. (Editor, with Elizabeth McCarthy), Lost Souls of Horror and the Gothic. North Carolina: McFarland, 2016. (Editor, with Elizabeth McCarthy and Darryl Jones) It Came From the 1950s: Popular Culture, Popular Anxieties, London: Palgrave Macmillan, 2011. (Editor) Shirley Jackson: Essays on the Literary Legacy, North Carolina: McFarland, 2005. Key Concepts in Contemporary Popular Fiction. Edinburgh: Edinburgh University Press, 2017. ‘I Mean, I Told You Not to Go in that House’: Place, Space and White Monstrosity in Get Out. (in) ed. Dawn Keetley, Approaches to Jordan Peele’s Get Out, Columbus: The Ohio State University Press, (Forthcoming). ‘Contemporary Serial Killers’ (in) eds. Maisha Wester and Xavier Aldana Reyes, Twenty-First Century Gothic, Edinburgh: Edinburgh University Press, (Forthcoming). ‘They Have Risen Once: They May Rise Again’: Animals in Horror Fiction, (in) Eds. Kevin Corstorphine and Laura Kremmel, The Palgrave Handbook to Horror Literature, Basingstoke: Palgrave Macmillan, 2018. ‘White Settlers and Windigoes: Teaching Monstrosity Within the American Gothic Narrative’ (in) eds. Adam Golub and Heather Hayton, Monsters in the Classroom, North Carolina, McFarland, 2017. ‘Horror Fiction from the Decline of Universal Horror to the Rise of the Psycho Killer’ (in), ed. Xavier Aldana Reyes, Horror: A Literary History, London, British Library, 2016.